The winner and runner-ups of World Mayor 2014 will be chosen based on the number of nominations in relation to the size of their cities and, more importantly, on the persuasiveness and conviction of testimonials received during this year's World Mayor Project. Below we publish a selection of comments received to date about WM nominee Aziz Kocaoglu, Mayor of Izmir, Turkey. Comment: Mr.Kocaoglu prioritized an integrated public transportation system in Izmir. He built more stations for the subway system and integrated them very well with the existing ferry, bus and intercity train systems. Now more citizens are using public transportation and less their cars which leads to a more environmentally greener Izmir. He supported peace and diversity among citizens in an environment where the city takes too much immigration within the country and the middle east. He used cities sources equally for them and helped for their basic and social needs. He provided great support for the rights and needs of the animals, poor, disabled, children and elderly. He build pavements for the disabled, provided milk for school children, made public transportation free for the elderly. 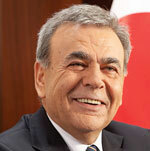 Comment: I support Aziz Kocaoglu as a worldmayor. Because he is very polite, honest, environmentalist and sensitive person. Also , I support his below application for İzmir. • He said that the seasides belong to people who live in İzmir and has not permit any concrete construction in the seaside. • He improved many application for disabled people in İzmir. • The subway system has been reaach to the wide area in İzmir. Comment: I support Aziz Kocaoglu and vote for him. He has never given up working hard for Izmir although he could have not gotten support from the government (opposite site). Comment: I have travelled many times in Turkey. It is a country very close to my heart; however, one can’t but notice the changes over these past few years. In a land where once Ataturk’s legacy held egocentrism at bay, in that same country that is currently slowly - but steadily  slipping away from true democracy towards instability, uncertainty and decay of moral political values, only few have been able to withstand the enforcement of an anti-secularist paradigm and maintain the idea that values modernism, education, equality and innovatory progress above all else. Comment: I support Mr. Aziz Kocaoglu for the 2014 World Mayor Prize due to his humanistic approach and relentless commitment to the values of diversity, sustainability and modernisation. Despite adminstering with little suport in a country where the ruling government has little transparency and a high level of corruption, Izmir (IBB) as one of Turkey's few opposition CHP party municipalities, thrives as a vibrant city under Azız Kocaoğlu's leadership. Always forward thinking, Mayor Kocaoglu has been behind the best and most sustainable public transport network in Turkey, consisting of light rail, subway, ferry and substantial bus and bicycle networks. Public transport is also made affordable for all with free transfers within 90min of travel (making it possible to travel from one end of this large city to the other for less than 2 liras) and special benefits for the elderly, students and teachers. Aziz Kocaoglu has also been instrumental in creating a wheelchair friendly city, implementing the pioneering 'Engelsiz Izmir' project engaging social and development policies to improve life for the disabled population of Izmir. Metro stations charge contain charge areas for electronic wheelchairs and most of the pavements of Izmir have tactile paving to ease mobility of the blind. Aziz Kocaoglu's Municipality gives priority to supporting people in need, an example being the 98,000 children who benefit from his 'Süt Kuzusu' project - where 2litres of milk is delivered to their homes on a weekly basis. As a foreign citizen in Izmir I feel comfortable and happy due to the accepting, tolerant and modern nature of the people of the city. Indicative of this celebration of diversity, Izmir Metropolitain Municipality is enagaged in a number of European Union projects and very welcoming to people of all cultures, For excellence in this field, Aziz Kocaoglu's Municipality has been awared the prestigious 2014 'Plaque of Honour' by the Council of Europe. Aziz Kocaog˘lu's administration supports minority rights. With a number of his highest officials being female, Aziz Kocaoglu's council is an example of the egalitaraian potential of secular Turkey. Mayor Kocaoglu is also supportive of the democratic process, with his Council Parliament meetings being streamed live for public participation and has himself participated in protests in Izmir with minority groups that have otherwise been persecuted by the Government. Comment: I support Mr. Aziz Kocaog˘lu in 2014 World Mayor Prize especially because of Izmir Metropolitan Municipality's (IMM) continuous and significant efforts in environmental sustainability. Great Gulf Project aiming to treat and improve Izmir’s Gulf, Great Channel Project aiming to protect ecological balance, Solar Sludge Digestion and Drying Facilities, generation and distribution of natural geothermal energy as an alternative source, separation of rain water and domestic waste project, promotion of organic agriculture with agricultural education project, establishment of Turkey’s first organic certificate bazaar, compost-soil-leaf analysis labs, improvement of drinkable water network, recycling projects, Smart Transportation Projects (15 new environmental ferries in Izmir Gulf, bicycle roads and municipal rental bicycles project, enlargement of the rail system network, environmental tram project).